Pete Firman: Marvels on Thursday 28th February 2019 at Hinchingbrooke Performing Arts Centre. Doors open at 7.00pm, the show starts at 7.30pm. Following Huntingdonshire saxophonist Robert Burton's prize-winning performances in the 2018 'BBC Young Musician of the Year' competition, he returns to his old school to team up with flautist Emma Halnan, herself a BBC Young Musician prize-winner in 2010, and now regularly performing at venues world-wide. They will present an exciting and varied programme, each in duo with their respective pianists, Manon and Christine, both of whom have already achieved exceptional international success as solo and ensemble players. Their programme will include music by Donizetti, Prokofiev and Russell Peterson's trio for flute, saxophone and piano. The Flipathon will take place on Tuesday 5th March 2019, around the boundary of the Market Square, starting at 11.00am. The event is completely free and is open to individuals of all abilities and ages, as well as teams of four for a Retail Relay. Any speedy flippers will be instantly disqualified, as judging is based purely on flipping style and variety! The event always kick-starts with Mayors of local market towns taking part in the famous 'Chain Gang' Flipathon! 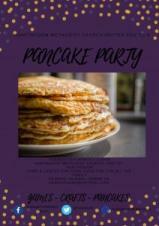 Come along to see who has the most flair and creativity with their pancake flipping techniques! Medals will be awarded to those in first and second place. Everyone who takes part will receive a small chocolate egg. There are various ways that you can take part in the Flipathon; you can collect an entry form from the Town Council offices at the Town Hall, Market Hill, Huntingdon, or e-mail hayley.burns@huntingdontown.gov.uk or simply turn up on the day to cheer our entrants on. Please contact the Town Council before Monday 25th February 2019 to let us know if you'd like to enter. Free Pancake Party at Huntingdon Methodist Church. 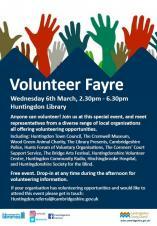 Huntingdon Library will be hosting a volunteer Fayre on Wednesday 6th March 2019 from 2.30pm - 6.30pm. Anyone can volunteer! Join us at the special event, and meet representatives from a diverse range of local organisations all offering volunteering opportunities. Including: Huntingdon Town Council, The Cromwell Museum, Wood Green Animal Charity, The Library Presents, Cambridgeshire Police, Hunts Forum of Voluntary Organisations, The Coroner's Court Support Service, The Bridge Art's Festival, Huntingdonshire Volunteer Centre, Huntingdon Community Radio, Hinchingbrooke Hospital and Huntingdonshire Society for the Blind. FREE event. Drop-in at anytime during the afternoon for volunteering information. EngAGE in the Afternoon: Author Guinevere Glasfurd at Huntingdon Library on Thursday 7th March 2019 from 1.30pm - 3.00pm. From Mary Shelley to John Constable to René Descartes, join for an entertaining afternoon as Guinevere discusses why she writes historical fiction, and her experience of being nominated for the COSTA prize. 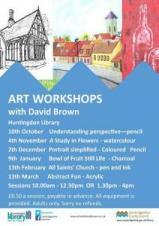 Booking is required, please speak to library staff or call 0345 045 5225 for a ticket. A meeting of the Planning Applications Panel. 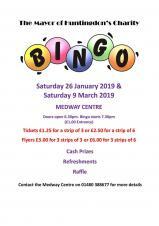 Bingo is back by popular demand ! All money paid to purchase bingo books/flyers, will be paid back out as winnings, so big amounts to be won ! Raffle tickets will be on sale along with refreshments. All money raised will go towards the Mayor of Huntingdon's Charities. £1 entry on the door and it's eyes down for 7.30pm. Please note that you must be over the age of 18 to play cash bingo. Commonwealth Day Flag Raising from 10:00am at Huntingdonshire District Council, Pathfinder House, Huntingdon. Join the Festival Fever at Huntingdon Racecourse on Wednesday 13th March. Enjoy 7 fantastic races whilst enjoying all the action from Cheltenham on our large screens. For more information visit www.thejockeyclub.co.uk or call 020 7611 1800. Please join for delicious homemade refreshments, have a go on the tombola and raffle stalls and browse the wide range of handcrafted good on the craft stalls. Shhh! Something unusual is happening in your library... A group of contrarian 'Librarians' from Prestiferous Theatre roam the library, archiving, shelving and literally flying with their beloved books. Lose yourself in a fictional frenzy or paperback puppetry, scale the shelves with a chorus of thesaurus, discover dance in a romance and mine in crime. Follow the 'Librarians' around for an interactive experience you won't forget! Join the performers fr a workshop after the show. 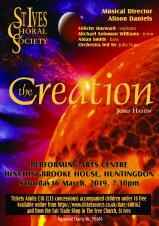 St Ives Choral Society perform Haydn's masterpiece for chorus, orchestra and three soloists, a musical depiction of the creation of the world and all its creatures in the Book of Genesis; there are exciting and energising choruses and arias that range from the dramatic to the ethereal. Directed by Alison Daniels and accompanied by an orchestra of local professionals, this promises to be an evening not to be missed! A meeting of the Twinning Sub Committee. A meeting of the Planning Committee. A meeting of the Leisure & Community Services Committee. The Mayor of Huntingdon's Civic Sunday Service will take place in All Saints Church Huntingdon on Sunday 24th March 2019 from 2.30pm. The Mayor of Huntingdon very much hopes that you will be able to join her on this Civic occasion. Masayuki has been a regular and extremely popular performer in the Bösendorfer series since 2007. Apart from the deep understanding, musical and pianistic skills needed for the standard repertoire, of which he has an abundance, he has a special affinity with the works of Rachmaninov , twice filling the Wigmore Hall with large and exceptionally appreciative audiences. He has an international career to match these successes. 'Masa' will include in his programme music by Beethoven and Rachmaninov. 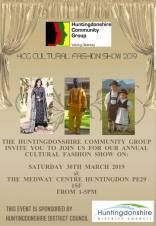 The Huntingdonshire Community Group will be holding their annual Cultural Fashion Show on Saturday 30th March at The Medway Centre Huntingdon. Doors open at 1pm for a 1.30pm start. This is a free event open to the whole community.